Growing Power Volunteers work with disabled young adults, including Sergey Silvers (pictured), who gain confidence and communication skills through garden activities. Connecting to Nature - Retired special education teacher Mary Hugenschmidt shows a seedpod to Terriona Dula. The program exposes participants to the natural world. Team Effort With the BOOST job training program for Henderson County sophomores, the students work together to design and plant a garden plot and must follow a budget. The greenhouse at Bullington Gardens in Hendersonville is transformed from a quiet shelter for plants into a hub of activity in an instant. Horticultural therapy students have arrived from East Henderson High School full of excitement for the day ahead. The 12-acre public garden is a sanctuary where visitors can wander through an herb bed or dahlia field, learn about rain gardens, explore native woodland flowers, or sign up for one of the many workshops, which cover everything from terrariums to grafting. Bullington also offers horticultural programs, one for Henderson County sophomores and a therapy program open to young adults with physical and intellectual disabilities. On this particular day, the therapy students have come to learn about birds and seeds, and in the process they’ll gain confidence and connect with nature. “Wow, look at this,” Hugenschmidt remarks as she plucks a dried pod and passes it to 18-year-old Hunter Rodriguez. “I think there’s seeds inside,” he replies with awe as he cradles the tiny specks in his hands. The main activity today is a craft project related to birds. As the students glue seeds and nuts onto wooden birdhouses, they engage with the activity and each other in different ways. “It’s amazing the number of different populations of folks that will be keyed into this interaction,” Hugenschmidt says. Rodriguez says he “feels peaceful” when he’s at the garden. He especially likes digging in the dirt and learning about science. He loves his family and three dogs, but says he also worries about finding a job now that he’s 18. Exceptional students need support as they cross into adulthood, and that’s part of Bullington Gardens’ mission. 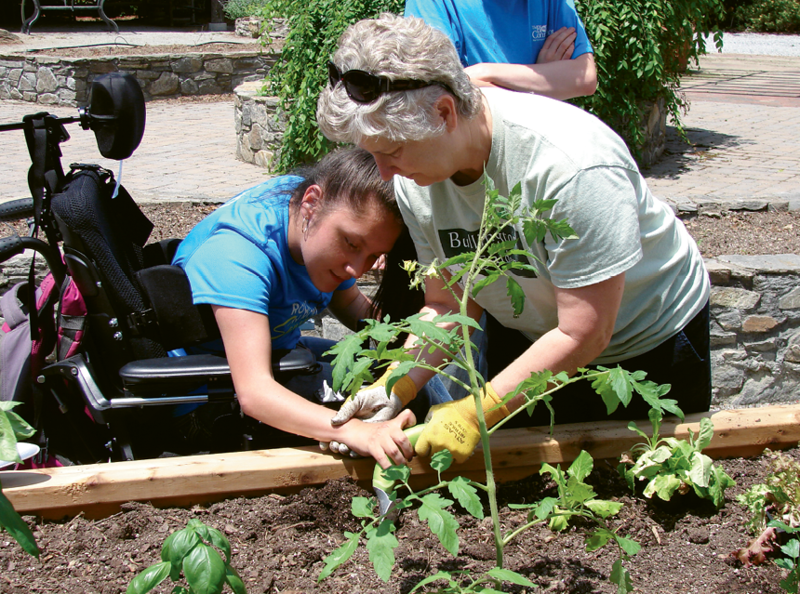 In addition to the horticultural therapy program for students with moderate and profound disabilities, Bullington also offers BOOST (Bullington Onsite Occupational Student Training), a program for Henderson County sophomores in need of job training skills. They work on the trails and grounds and participate in a yearly garden competition. Over the course of the semester, the students design a garden plot and grow the plants, all while sticking to a budget and working as a team. Bullington Gardens director and registered horticultural therapist John Murphy says that both horticultural therapy programs aim to improve verbal and written communication and develop decision-making skills. “We think that by doing some of the activities that we do to build confidence and communication, we’re helping them towards success throughout the rest of their day,” he says. After a lively afternoon in the therapy garden and greenhouse, the last activity is in the vegetable garden. Hugenschmidt pulls two root vegetables from the raised bed and asks the students what they are. Some students are stumped by the gnarly, oddly shaped vegetables, but Rodriguez finally shouts out, “It’s kohlrabi,” and the class cheers. To learn more about programming or public workshops (such as Vegetable Gardening Basics, March 14-16) call (828) 698-6104 or visit www.bullingtongardens.org.